The Future Battery Industries CRC will involve 58 industry, government and research partners, and has the backing of a $25 million grant from the Federal Government and more than $110 million in support from the research centre's partners. 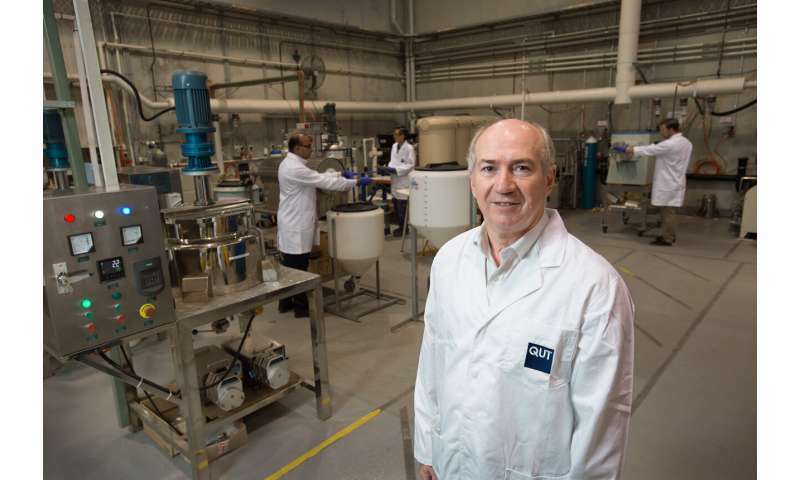 Professor Peter Talbot from QUT's Institute for Future Environments, who last year produced Australia's first lithium-ion battery at QUT's pilot plant precinct at Banyo, will lead the research program into battery materials and storage system development. Professor Talbot said Australia had the resources and skills to produce the "whole picture" of battery technology. "A battery industry for Australian can go from mining, to usage and even to export," Professor Talbot said. "Battery technologies give you energy security. Storage capability allows you to call on renewable energy any time of the day or night." "The CRC will be looking at doing it all in Australia – mine it, value add it, produce the components, make the batteries as I've shown in the example at QUT with our plant, put together the storage packs and then integrate it all with the power companies. "It's about a whole industry." "Given Australia's abundant resources of battery minerals and world-class resources sector, the potential to promote the nation's premium-quality, ethically sourced and safe battery minerals and metals through forensic-accredited and traceable sources will also be investigated, paving the way for Australia to position itself as a global leader in the international battery value chain," Mr Shanahan said. Australia is the world's largest miner of lithium. Exports of lithium have risen from $117 million in 2012 to $780 million in 2017, and are expected to rise to $1.1 billion by next year. Nathan Cammerman, executive director of Queensland-based company Multicom Resources Ltd, said the research centre "sends a clear signal to our international partners, and the broader global market, that when it comes to raw material supply, battery technology development and its subsequent manufacture and deployment, Australia is clearly open for business."